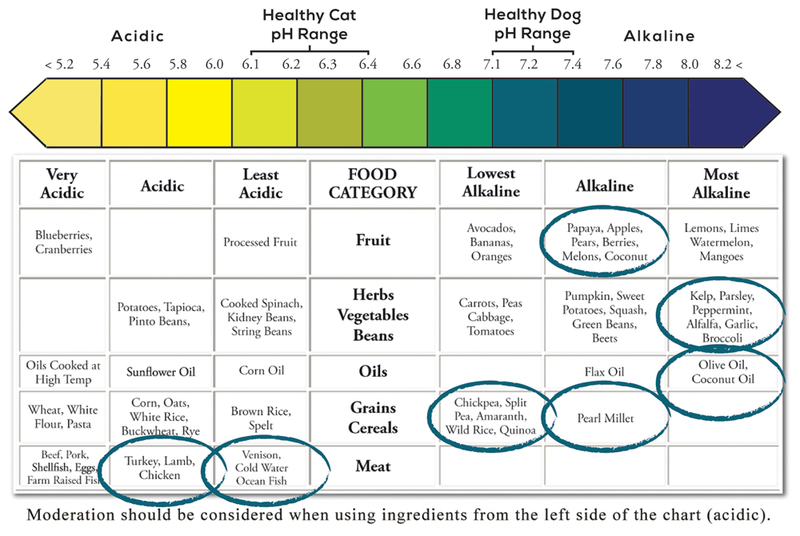 Alkalinity - Improve Pet's Quality of Life - Canine Caviar Pet Foods Inc.
pH balance is key to good health and natural healing. Reduces amount of Oxygen in the blood. Degenerative diseases are acidic and devoid of oxygen. Leaches calcium from bones is released into the kidney, resulting in stone formation before being excreted. Acidosis is excessive consumption of protein, which is metabolized “acidically” because of sulfur content. Without enough oxygen the DNA self-repair mechanism will not function causing free radical damage. Diet and water are the most important changes we can make to balance the dog’s natural pH. By feeding them the alkaline food, you provide them a pH balance body for good health and natural healing. Will help to prevent against health concerns and degenerative diseases. Will help settle digestive upsets, reduce scratching and hotspots. Will reduce anaerobic activity (aging) and increase aerobic activity. The same as they would eat in nature. The following list indicates which foods are acidic and alkaline. The left side of the chart indicates acidic foods, or foods that are more harmful. The right side of the chart indicates alkaline foods, or food that would be most beneficial.